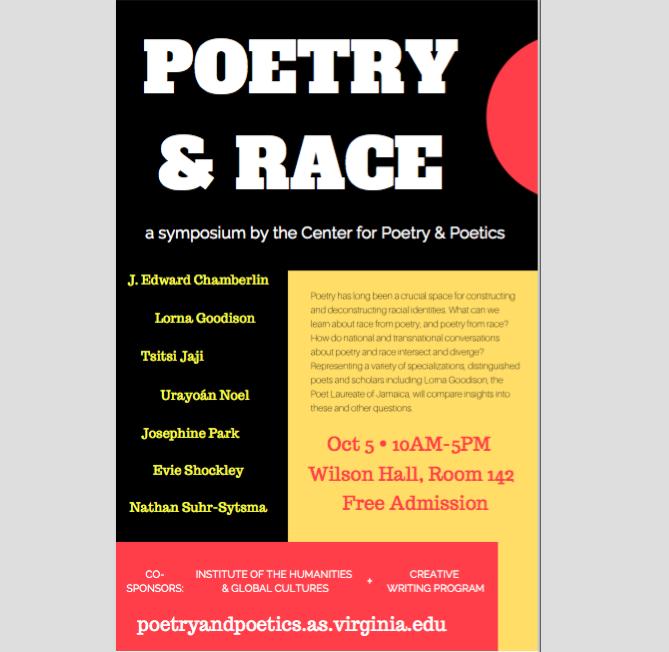 Please join us Friday, October 5 for “Poetry and Race,” a symposium hosted by the Center for Poetry & Poetics. This event will bring to grounds a group of internationally renowned poets and scholars for a day of panel presentations and interactive discussion. It will conclude with a poetry reading and reflection by the Poet Laureate of Jamaica, Lorna Goodison. Poetry has long been a crucial space for constructing and deconstructing racial identities. What can we learn about race from poetry, and poetry from race? How do national and transnational conversations about poetry and race intersect and diverge? Representing a variety of specializations, distinguished poets and scholars will compare insights into these and other questions.